Stress Relief: Just enter material and the desired stress relief time, Pyro-Sim calculates the temperature necessary for equivalent stress relief results. Tempering for Hardness: Just enter carbon content, the required Rockwell hardness "C" and the tempering time, Pyro-Sim calculates the temperature necessary for the desired result. 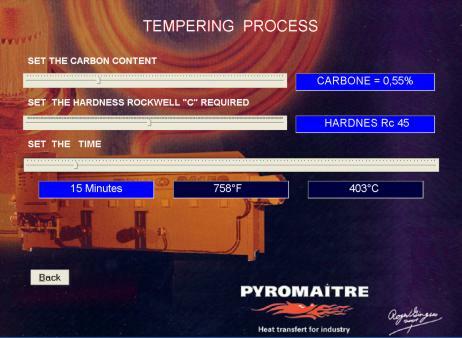 Tempering at the Temperature: Just enter carbon content, the temperature and the tempering time, Pyro-Sim calculates the resulting Rockwell hardness "C". Extrapolation: Set time and temperature of your actual treatment. Just enter the desired time, Pyro-Sim calculates the temperature for the equivalent cycle..